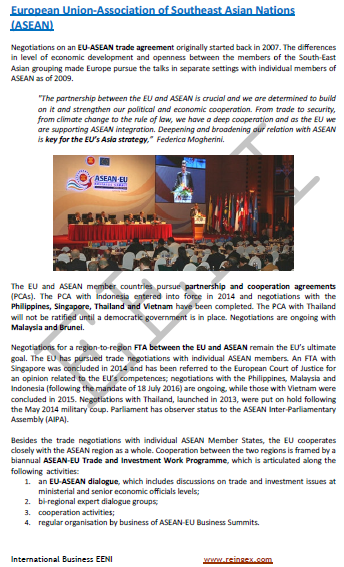 Syllabus of the Online Course (Subject): Trans-Regional ASEAN-European Union Trade Initiatives. To promote international trade and foreign direct investment flows between the Association of Southeast Asian Nations (ASEAN) and the European Union (EU), both economic blocs signed the Trans-Regional ASEAN-European Union Trade Initiatives. This initiative is a policy dialogue mechanism and process on economic and trade-related topics.